Dr. Sonny Goel, MD, offers advanced iLASIK surgery at his Baltimore, MD-area practice. Unlike traditional LASIK, iLASIK uses a laser to create the corneal flap instead of a blade, minimizing risks. During a consultation, Dr. Goel can determine if this sophisticated approach to LASIK is right for you. What is the Difference between iLASIK and LASIK Surgery? Both iLASIK and LASIK surgeries correct refractive disorders, such as nearsightedness, farsightedness, and astigmatism. The cornea focuses incoming rays of light onto the retina, which transmits signal to the brain through the optic nerve. However, if the shape or condition of the cornea prevents it from refracting light properly, your vision will be blurry or distorted in some way. While traditional LASIK procedures use a microkeratome blade to create the corneal flap that grants access to the inner layer of the cornea (the stroma), iLASIK uses a laser. This approach minimizes the risk of infection, and can result in a faster recovery. iLASIK is an extremely safe procedure, but if you have certain eye conditions, such as glaucoma, you may not qualify for treatment. In addition, patients should not undergo IntraLase® or any other type of LASIK surgery until they have worn the same glasses prescription for at least a year and their vision is stable. If you are pregnant or breastfeeding, you should not undergo LASIK, since vision fluctuation is common during these times. Dr. Goel will evaluate your vision and health history to determine your candidacy for laser eye surgery. While traditional LASIK uses a blade to create the corneal flap, iLASIK uses a laser. Prior to surgery, Dr. Goel will numb your eye to maintain your comfort during the procedure Then he will create a flap in your cornea using the IntraLase® laser. Rapid pulses of high power energy will create microscopic bubbles just under the surface of your cornea. Dr. Goel can gently lift these tissues with little impact to the rest of your eye. Next, your surgeon will use an excimer laser to reshape your cornea. 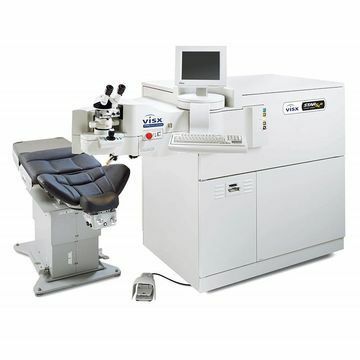 By removing tiny layers of tissue, he can correct the refraction of light and give you clearer, sharper vision. iLASIK involves a very short recovery and little postoperative discomfort. You may experience some minor irritation and blurred vision, but these side effects will typically go away within a few days. We do ask patients to arrange for transportation after the procedure, but you can usually go back to work the following day and take up your normal exercise routine in a week. Patients usually experience a significant improvement in vision during this timeframe, though full results may take up to six months. To further expedite your recovery, we will provide a detailed list of post-operative instructions. One of the most important things you can do is to attend regular follow-ups with Dr. Goel. During these visits, he will monitor your progress and make sure there are no complications. Dr. Goel is dedicated to providing his patients with the highest quality care in addition to the most comprehensive treatments. To learn more about whether blade-free IntraLase® surgery can improve your vision, contact Dr. Goel’s office today.